The Anarchism, Crime, and Justice Conference promotes a safer space in which all must feel welcome, supported, and secure. No one should endorse or tolerate racism, sexism, anti-LGBTTQQIA sentiments, ableism, speciesism, or any other kind of oppressive behavior. Please make sure to not take pictures of anyone without permission. Please also do not give information out of others or answer questions about others without permission. All rooms and bathrooms are accessible. Please avoid wearing fragrances or strong scents, as the odors may cause allergic reactions. If you have any requests for assistance such as a translator, note taker, medication, childcare, or physical accessibility, please let us know by e-mailing Anthony nocellat@yahoo.com. (We understand this conference is not fully inclusive because of cost, but we do want to address these issues as they are needed to confront ableism). Each room has a projector, computer, and the internet. We will also have a video camera recording each session, which will be uploaded onto Save the Kid’s YouTube. We will also be taking pictures, which will be uploaded on the internet. 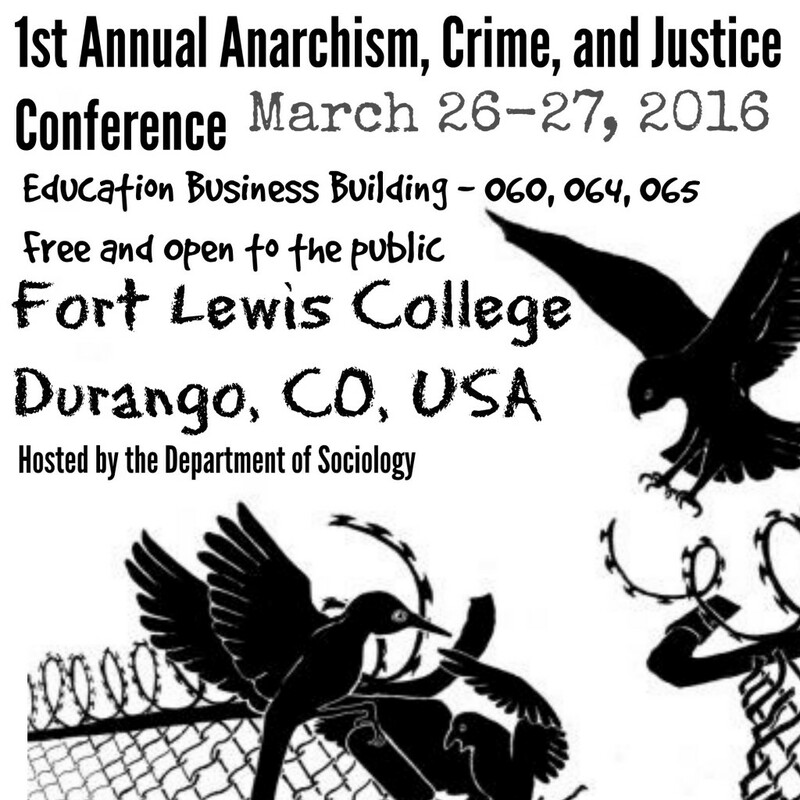 Activists and scholars working within the realm of challenging the current punitive criminal justice system are welcome to submit for the 1st Annual Anarchism, Crime, and Justice Conference, an anarchist criminology conference. This conference is structured around challenging and abolishing punitive justice, while promoting community-based alternatives such as restorative justice, transformative justice and Hip Hop battling. This conference welcomes all those interested in providing performances, workshops, lecturers, teach-ins, roundtables, and film screenings. Topics of interest include prison abolition, prisoner support, critiques of political repression, police abolition, de-colonialism, abolition of zero tolerance policies and the school to prison pipeline, all forms of academic repression, corporate repression, state terrorism, all things pertaining to youth justice, total liberation, intersectionality, horizontalism, LGBTTQQIA, mutual aid, disability liberation, Black liberation, indigenous sovereignty, racial justice, animal liberation, environmental justice, green anarchism, anarchism, and justice. This conference also welcomes all forms of art and music for social justice such as Hip Hop activism. ABSTRACT: Based upon a book chapter Socha co-authored with Lara Drew in Anarchism and Animal Liberation: Essays on Complementary Elements of Total Liberation (McFarland, 2014), this presentation will explore how anarchist principles arising from educational and anti-capitalist thought can be used as organizing and solidarity building tools in the animal liberation movement. Part critique of the non-profit industrial complex and part practical ideas for integrating anarchist educational theory into activist praxis, Socha will offer new ways of looking at a movement at a crossroads: we become entrenched in the very system that exploits the species we wish to liberate or we take new, less hierarchical, money-driven paths toward liberation. Needless to say, she’ll be arguing for the latter. BIOGRAPHY: Kim Socha, Ph.D, is author of Women, Destruction, and the Avant-Garde: A Paradigm for Animal Liberation (2012) and Animal Liberation and Atheism: Dismantling the Procrustean Bed (2014). She has also served as contributing editor to Confronting Animal Exploitation: Grassroots Essays on Liberation and Veganism (2013) and Defining Critical Animal Studies: A Social Justice Approach for Liberation (2014). She is an animal advocate, social justice activist, and English professor. BIOGRAPHY: Dr. John Lupinacci is an Assistant Professor at Washington State University. His ecocritical work in education is interdisciplinary and draws from heavily from critical social theory through anarchist philosophy, critical animal studies, post-structuralism, and queer-ecofeminist philoshophy. His experiences teaching as a high school teacher, an outdoor environmental educator, and a community activist all contribute to his research, teaching, and organizing direct actions aimed at examining the relationships between schools and the reproduction of the cultural roots of social suffering and environmental degradation. ABSTRACT: Drawing from eco-social anarchism in connection with an ecocritical framework, the author of this paper asserts that to be human is all too often defined by a person’s or group of people’s, denial of their animal-self, which has resulted in the illusion of existence as separate from and superior to each other and the natural world. Endemic of Authoritarian cultures this separation is physically impossible by all biological definitions, many seem to have embraced this socially constructed and fatal cultural assumption. The author positions this cultural premise of separation and superiority at the root of habits and behaviors destroying life and endangering humans as inhabitants of the planet. In this paper, the author addresses the potential for education to confront authoritarianism and foster both an understanding of and a healing from this fundamentally fatal premise of human superiority through anarchist projects of insurgent art. ABSTRACT: While most discussions of anarchism focuses exclusively on either capitalism or the state, this paper attempts to expand this discussion to explore what a critical animal studies position would look like if it actively engaged with the inherent violence and destruction found within industrial civilization. By focusing not just on capitalism but on industrialism, this paper argues that we need to expand our understanding of what an animal liberation politics is and include confronting not just slaughterhouses and vivisector labs but fossil fuel projects, industrial farming, and large scale technological projects. BIOGRAPHY: Sean Parson is an assistant professor In the departments of Politics and International Affairs and Sustainable Communities at Northern Arizona University. Is if completing a book manuscript on Anarchist Homeless Activism in San Francisco and is working on a new project on Superheroes narratives in comics and movies and the intersection of cultural studies, environmental political theory, and critical animal studies. ABSTRACT: This workshop will discuss what Durango Prisoner Letter Writing does, how to write prisoners, why it is important to write prisoners, and this workshop will actually give time to write prisoners. BIOGRAPHY: Dabney Meachum is a senior at Fort Lewis College majoring in Political Science and minoring in Sociology. Dabney is a Co-Founder and Co-President of FLC’s Black Student Union. She is also a Common Ground Diversity Facilitator, and involved in Durango Prison Letter Writing Club. She is particularly passionate about issues that affect Alaskan Natives and preserving Indigenous culture and identity. She plans to pursue a postgraduate degree in documentary film and eventually go to law school. Dabney was raised in Juneau, Alaska and enjoys traveling and reading. ABSTRACT: The institution of slavery, in conjunction with a genocidal colonialist expansion across the land now known as the United States, solidified a white supremacist racial order that continues to persist in many varied ways, including through the modern penal system. State and federal governments as well as private corporations are able to forcibly extract labor from the country’s extremely large incarcerated population. This extraction is done in coercive ways and in abusive conditions for very little pay. The Free Alabama Movement (FAM), in conjunction with IWW labor activists and other prison supporters and organizers, have called for a national work stoppage across prisons and detention facilities to disrupt the prison industries and to demand fair wages and fair working conditions. FAM is led by prisoners incarcerated in Alabama and successfully initiated a statewide work stoppage in 2014 that helped to galvanize support for the end of prison slavery and the momentum to implement actions across the United States. The presenters are outside supporters and are helping to coordinate a national work stoppage and prisoner protest. We will discuss strategies, tactics, challenges, and the support needs of the incarcerated workers. BIOGRAPHY: Colleen Hackett is an Assistant Professor of Sociology at Colorado State University Pueblo. She writes about and organizes against the carceral state and gendered violence. She facilitates a prisoner-led group for prisoners with histories of intimate partner violence in a women’s prison and co-edits a new prisoner publication for prisoners identifying as women, gendervariant, and/or trans, entitled Unstoppable! publication. BIOGRAPHY: Ben Turk has been working with prison rebels in Ohio for the last five years, but also touring the country extensively with Insurgent Theatre, an anarchist theatre troupe. He has also been on the organizing committee of the North American ABC Conference for the last three years. Please visit LucasvilleAmnesty.org, SupportPrisonerResistance.net and InsurgentTheatre.org for more information. ABSTRACT: In this presentation I argue that penal abolition activists and scholars can increase the power and appeal of abolition proposals and abolition thinking by showing how normative “criminal justice system” practices and thinking rest on a thoroughly utopian vision of humans, institutions, and society. Perhaps no criticism of penal abolition proposals is more common than the one which declares them as so deeply idealistic and dis-attached from reality that they can only be called utopian. Leaving aside the question of how specific abolitionist proposals are or are not utopian, in this presentation I demonstrate how a careful consideration of the ideas and practices of modern “criminal justice systems” shows that they stand on a foundation that is profoundly utopian. For example, I explore the “criminal justice system’s” utopian assumptions (1) that people are either good (non-criminals) or bad (criminals), (2) that the threat of punishment and/or imposition of punishment prevents crime and is an effective social control mechanism, and (3) that human behavior can be controlled by the threat of, or actual use of, law, police, courts, and prison. In this fashion the argument that penal abolition is utopian is reversed and instead placed on modern “criminal justice” practices. BIOGRAPHY: Michael J. Coyle, Ph.D., is Associate Professor, in the Political Science Department of California State University, Chico. In his teaching, research and community work he examines language, everyday life, and public policy to expose the social construction of discarded persons – such as the deviant, the excluded, the underclass, the homeless, the imprisoned, and other groups identified for their difference from promoted norms (who are characterized as “unlike us,” “dangerous,” and “punishment-worthy”). Michael grew up in Greece, earned a BA in Comparative Religious Studies, an MA in Philosophical Anthropology, and a Ph.D. in Justice Studies. ABSTRACT: The United States incarcerates a larger proportion of its residents than almost any country in the world. Yet it still has exceptionally high crime rates with the homicide rate being one of the highest rates in the developed world. This strongly suggests that high incarceration rates do not decrease crime. Needless to say, if high incarceration rates do not decrease crime they are probably unjust given that they come with significant personal and economic costs. These considerations provide strong reasons in defense of criminal justice reform. It is crucial that reform be effective. I will take the efficacy of a given policy change to be a function of its importance, tractability, and neglectedness. For any given cause one might consider inter-cause issues (such as the question: is criminal justice reform more effective than economic policy reform?) and intra-cause issues (such as: what is the most effective way of decreasing incarceration rates). This piece will address both of these issues highlighting important uncertainties. I will draw on the recent work of GiveWell and the Open Philanthropy Initiative in doing so. One important uncertainty in inter-cause issues concern criminal justice reform’s importance relative to other causes. One important uncertainty in intra-cause issues concerns the relationship between moderate and large-scale reforms. BIOGRAPHY: Caleb Ontiveros is currently in the philosophy doctoral program at Notre Dame. He was born in Santa Barbara, California, but grew up in Colorado. Before attending Notre Dame, he attended Durango High School (’11) and then Fort Lewis College where he obtained a B.A. in philosophy (’14). He’s primarily interested in moral and political philosophy, in particular, the philosophy of effective altruism. He enjoys listening and making music, is currently teaching himself to code, and volunteers for effective altruist organizations performing a number of activities (from organizing Skype calls between local groups to registering a charity in the UK). ABSTRACT: This workshop is a introduction to nonviolent direct action. Come learn how to effectively create social change through grass-roots activism such as blockading, protesting, and security culture. BIOGRAPHY: Ian Perry, born in Portland OR. Became involved with animal rights activism and community based anarchism in 2005. Moved away from Oregon and radicalism only to find that its much more important and needed in smaller community’s to organize against the oppressive and destructive systems we live under. Currently residing in Durango CO Ian is focused on helping build the roots of the radical community and restoring the land he currently resides on. BIOGRAPHY: Sean Summers is an active member of the Fort Lewis College Sociology Club, Durango Prison Letter Writing, The Dirty Hands Collective, and environmental justice campaigns. Sean became committed to anarchistic environmental justice through a slow process of independent learning in tandem with an undergraduate study in Communications. When not busy with schooling, Sean enjoys spending his time in the wild areas of the four corners region. BIOGRAPHY: Sam Allen is an undergraduate student at Fort Lewis College in Durango, Colorado. ABSTRACT: This Presentation will discuss the criminalization and culture of Hip Hop. BIOGRAPHY: Bo Coleman is a undergraduate Sociology sophomore at Fort Lewis College. Bo’s scholarship is about challenging the criminalization of Hip Hop and youth culture. Bo is interested in examining Hip Hop culture and artists’ experiences of oppression. BIOGRAPHY: Matthew Cedeno-Winter grew up in the midwest region and currently is an undergraduate student at Fort Lewis College. He loves snow boarding and Hip Hop and after graduating from Fort Lewis College wants to be a social worker in Latin America to help people survive and find happiness within society. BIOGRAPHY: Mahon Walsh is twenty-years old and a sophomore at Fort Lewis College majoring in sociology and criminology. He hopes to pursue a career in law enforcement after he graduates. He is from San Jose, California and a member of the Navajo nation. Mahon is part of the Hip Hop criminal justice group along with other students from Sociology 321 course. BIOGRAPHY: Molly Wieser is the Title IX and Student Conduct Coordinator at Fort Lewis College. Previous work includes the Cleveland Catholic Worker Community, The Legal Aid Society of Cleveland, Women’s Re-Entry Program (Cleveland), The Racial Fairness Project and the Ohio Free the Vote Coalition (Cleveland), American Friends Service Committee (Ohio and National), and the Colorado Public Defender (Durango). Focus areas of her work have included radical hospitality, child custody rights of incarcerated and formerly incarcerated parents, racial discrimination and disparities in the criminal justice system, voting rights of formerly incarcerated people, and the abolition of solitary confinement, the death penalty and prisons generally. ABSTRACT: This presentation provides an overview of “social movement literacy” (SML), which is a project that I am currently developing. SML seeks to educate the general public on how to properly read and understand the nature and function of social movements. Social movements are invaluable contributors to our collective lives, but yet, very few people—outside of activists and specialized academics—are properly educated about the histories, conditions, goals, tactics, and influences of social movements. Politically, SML seeks to desensitize people to the “otherness” of social movements; cultivate empathy for social movement activity; and create conditions for the possibility of more social movement participation. Cultivating such “rebel knowledge” is a strategic approach for radicalizing the general public. ABSTRACT: This presentation explores the meaning of community autonomy. Why and how do different radical spaces experience different ‘depths’ of autonomy from dominating structures, both externally and internally? The spaces in the Occupy encampments created semi-autonomous platforms for organizing in urban centers, yet, relative to other spaces, like the Argentine workers’ cooperatives, the ‘autonomy’ of Occupy feels shallow. This presentation begins to explore some of the contextual elements that set these spaces apart from one another, arguing that shifts in local opportunity structures and the degree of saturation of horizontal practice into the productive and reproductive work of everyday, social life shape the ‘depth’ of autonomy found in horizontal spaces. BIOGRAPHY: Jay Brooks is a graduate of the University of California, Santa Barbara. He is currently a graduate student in sociology at the University of Illinois at Urbana Champaign. His area of specialization is in transnational social movement studies, and his current research focus is on radical horizontal communities and organization. Movement participation is important to him, as is the conversation between research and movement building, and the merging of theory with practice. ABSTRACT: Poetry Behind the Walls (PBW) book series, is one of the only ongoing book series in the world that is dedicated to writings from youth that are incarcerated. PBW the Walls book series, is a project of Save the Kids. PBW is a fully-volunteer project to promote the voices of youth incarcerated in the U.S. This project is not a fundraiser for Save the Kids. BIOGRAPHY: Hanna Maddera is currently a Communications and Graphic Design student in Durango, Colorado. She is an officer for two student-led organizations, Sociology Club and Feminist Voice. Through these organizations, she runs a student food pantry, writes to prisoners, organizes events and fundraisers, and self-publishes radical literature through the form of zines. She is the Lead Print Design and Photography Editor of The Independent Student News Magazine, DJ of KDUR’s GURL HURL, and she works with developmentally disabled elderly citizens through Community Connections. ABSTRACT: We are a network of facilitators trained in an anti-bias educational program that promotes cultural awareness and combats discrimination. We are seeking to heal and protect our campus and community from past, present and future acts of discrimination and prejudice. We do this through education and awareness and by connecting students, faculty and staff and community members in intercultural dialogue and introspective activities. BIOGRAPHY: MeKayla Smith is a senior ungraduated student at Fort Lewis College majoring in Psychology. She is hoping to pursue another degree next year in adventure education at Fort Lewis College. MeKayla is currently a staff member of the Program for Diversity and Resident Assistant at Fort Lewis College. MeKayla is the Co-President and Co-Founder of the Black Student Union, which was founded in October 2015 and is involved in LGBTTQQIA causes. In her free time she likes hiking, rock climbing, and dancing. BIOGRAPHY: Dabney Meachum is a senior at Fort Lewis College majoring in Political Science and minoring in Sociology. Dabney is a Co-Founder and President of FLC’s Black Student Union. She is also Common Ground trained and a passionate social justice student activist. She plans to pursue a postgraduate degree in documentary film and eventually go to law school. Dabney was raised in Juneau, Alaska and enjoys traveling and experiencing different cultures. ABSTRACT: Like most, I am enthusiastic about the development of restorative justice as a tool to heal and transform people whose lives have been affected by violence. However, its promise as a structural, alternative that can reform or eventually replace incarceration is problematic. One example of this perspective is Coy McKinney’s argument that RJ is a method for divesting our collective consent from state punishment, and that by such divestment the state’s structures and methods can be critically undermined and replaced. I argue that the power that is offered by restorative justice is only available when its practice does not overlap with authoritative power, and is not coerced or policed. I further argue that it is a minority of crimes for which restorative justice is appropriate. By this I mean crimes that a) constitute a serious violation between two people and b) transgress a personal boundary, and not a power relation (e.g. property crimes). Finally, I argue that the nature of the state is such that it cannot be critically undermined solely by the withdrawal of consent. Restorative justice must be the tool of an active antagonism, not a model that can reform or replace the state’s structures of punishment. BIOGRAPHY: Eric received an MA in philosophy from San Francisco State University. There he studied environmental ethics and virtue theory. His studies there concerning philosophies of punishment and prison industrial complex were particularly radicalizing. Since graduating he has been teaching part-time at an energetic and diverse community college (Diablo Valley College). He also volunteers with the Prison University Project at San Quentin teaching writing and critical analysis. Eric is an anarchist trying to escalate his commitment to total revolution through writing, teaching, analysis, and other creative forms of action. ABSTRACT: The decision at ICOPA 2 in Amsterdam in 1985 to change the conference name from the International Conference on Prison Abolition to the International Conference on Penal Abolition represents an extension of ICOPA’s focus from the problem of incarceration to the problem of resorting to punishment, responding to violence with violence. Penal abolition moves in two dimensions: the political and the cultural. Political forces are grounded in what those who are punished most by the state—prisoners—tell us, and by those who are punished and threatened more by state violence at all levels of the criminal justice system—as black and brown lives are in my home country. They can have significant short-term abolitionist effects, both on incarceration levels and on treatment of those who are policed and incarcerated. The durability of political abolition of state punishment—of incarceration especially—depends on members of any society becoming familiar and comfortable with talking through their grievances, directly and safely, with those they blame and fear, and in Roger Fisher’s terms “get to yes!” on how to proceed. I call studying and learning to follow this practice “peacemaking.” Here, I draw especially on issues the political forces raise about the violence of incarceration, of prosecution, and of policing to illustrate how principles of peacemaking are and can be applied, breaking the punishment habit. BIOGRAPHY: Harold E. Pepinsky is Professor Emeritus in Criminal Justice at Indiana University, Bloomington and now living in Worthington, Ohio. ABSTRACT: The most recent wave of U.S. media coverage on the drug war has focused primarily on the success of marijuana legalization movement and increasing concerns over the heroin and opioid epidemic in middle and upper-middle class white communities in the United States. As part of these discussions, many pundits and journalists commented on the transition towards a more compassionate drug war in the United States. Still, however, these drug reforms have not altered the race, class, and gender biases that informed the longer history of the domestic and international drug war and social life in general. Our contribution to the Anarchism, Crime, and Justice Conference, and in keeping with the conference theme of Prison Abolition, Transformative Justice, and Fighting Repression will be part informative session and part community conversation and brainstorm session for further reform. First, Collier will provide a short presentation based on their senior thesis research on Native American cultural appropriation and queer exclusion within substance abuse treatment programs in the southwest. Santiago will then offer examples of the race, class, and gender injustices that drive marijuana legalization implementation in Colorado. We will then facilitate a community conversation/brainstorming session exploring possible avenues of reform and strategize on how to fight the injustices that still permeate progressive drug reforms. BIOGRAPHY: Santiago Ivan Guerra is an Assistant Professor of Southwest Studies at Colorado College. Santiago researches the impact of the drug war on communities along the Texas-Mexico Border, as well as the race, class, and gender biases that inform the marijuana legalization movement. BIOGRAPHY: Collier Modell is a senior Southwest Studies major at Colorado College completing a thesis that critiques the practices of cultural appropriation and heteronormativity within substance abuse treatment programs in the Southwest. ABSTRACT:Save the Kids (STK) is a fully-volunteer national grass-roots organization dedicated to alternatives to and the end of incarceration of all youth and the school to prison pipeline. This workshop will provide the attendee games and activities to use with group-building and community building along with discussing how to organize for the end of the incarceration of youth and the National Week of Action Against Incarcerating Youth. BIOGRAPHY: Anthony J. Nocella II, Ph.D. is an assistant professor of Sociology and Criminology, Gender and Women’s Studies, and Peace and Conflict Studies at Fort Lewis College. Dr. Nocella is the editor of the Peace Studies Journal, an Executive Director and co-founder of the Institute for Critical Animal Studies, National Co-Coordinator of Save the Kids, Director of the Institute for Hip Hop Activism, editor of Poetry Behind the Walls, and Director of the Academy for Peace Education. Dr. Nocella II has published more than fifty scholarly articles or book chapters and has published more than twenty-two books including “Igniting a Revolution: Voices in Defense of the Earth” (2006) and “Hollywood’s Exploited: Public Pedagogy, Corporate Movies, and Cultural Crisis” (2010). He is editor of the Critical Animal Studies and Theory book series with Lexington Books and Radical Animal Studies and Total Liberation book series with Peter Lang Publishing. Dr. Nocella is a co-founder of the fields of critical animal studies, disability pedagogy, eco-ability, radical animal studies, total liberation, and academic repression. ABSTRACT: In this presentation, I will explore the various intersections between white liberal feminisms and the penal system. In seeking state-driven solutions to gendered violence, white feminists secure narrowly defined visions of safety for themselves, to the exclusion of those unable or unwilling to align with hetero-whiteness. I will explore how, when white liberal feminists seek to implement legislation or intervene in the criminal legal system, we often see reform efforts that strengthen institutions that perpetuate economic exploitation, colonialist notions of progress, and white supremacy. I will explore the specific ways that dominant feminisms have played a crucial role in propping up the prison state to the disadvantage of communities of color, the trans community, and undocumented folks. The primary perpetrators of this injustice are gender-responsive “justice” and domestic violence legislation. I take my cues from anti-violence social movements largely led by women of color and will engage in a discussion about how to meaningfully deal with heteropatriarchal and colonialist violence, and what it means to explicitly disavow dominant feminisms. BIOGRAPHY: Colleen Hackett is an assistant professor in the Department of Sociology and Anthropology at Colorado State University in Pueblo. She facilitates a prisoner-led group, called Webs of Support, for those with histories of intimate partner violence at a women’s prison. She also co-edits a new publication by and for prisoners identifying as women, transwomen, and gender non-conforming, entitled Unstoppable! publication. ABSTRACT: Indigenous peoples are products of settler colonialism. Settler colonialism is based on a state apparatus with particular logics embedded in its structural psyche. These logics are the logic of elimination, the logic of expansionism, the logic of exceptionalism, the logic of denial and the logic of racialization. As a result of the simultaneous operationalization of these logics imposed against indigenous peoples by the settler colonial state, a consequential logic is produced- that being the logic of securitization. Settler colonialism is therefore based on historical and continued criminality including the perpetuation of institutionalized injustice against indigenous peoples evident in their predominance in the prison industrial complex in the name of security. The mass incarceration of indigenous peoples living under settler colonialism is merely a reflection of the logics of settler colonialism and the logic of securitization put into practice. The institutionalized and legislated genocide of indigenous peoples under these logics of settler colonialism gives way to the implosion or explosion of indigenous peoples; meaning self-destruction or revolutionary and transformational justice respectively. Potential for anarchy is ripe among indigenous peoples given the said realities as well as the fact that abolition of the settler colonial government in relation to the oppressive and repressive genocidal administration of their affairs is a key component to the restoration of justice and recovery of indigenous peoples- the human right to self-determination as a collective nationhood of peoples. The two settler colonial states that would be used as case studies to advance and explore these complex connections and phenomenon are Canada and Israel. First the outlining of the historical and contemporary criminality taking place against their respective indigenous peoples will be demonstrated as well as the perpetuation of systemic injustice will be made evident given the similar over-incarceration status. This will be followed by the demonstration of the implosion-explosion affect and the evident anarchism already happening or in the making. BIOGRAPHY: Ahmad Moussa is currently the Bail Supervisor to the Bail Verification and Supervision Program for a women’s prisoners rights agency in Canada; making the linkages between the over-incarceration of indigenous women and the national inquiry currently taking place in relation to the high number of missing and murdered indigenous women. He has also worked as a Bail caseworker for a men’s prisoner’s rights agency also dealing with predominantly indigenous men also over-incarcerated in Canada. He is a human rights public intellectual and activist, a Canadian of Palestinian origin and holds a Master’s of Arts in International Law and Human Rights-focusing on indigenous rights-making the connections between the plight of the Palestinians and the plight of indigenous peoples in Canada. ABSTRACT: Several researchers have documented the disproportionate representation of minorities in school discipline and incarceration settings. In the 2009–2010 school year, research shows nationally 17 percent of African American, 8 percent of Native American, and 7 percent Latino American students were suspended at least one time. In addition, studies show African American and Latino males represent the largest percentage of inmates in correctional facilities throughout the United States. While research has documented the relationship between race and the school to prison pipeline, the relationship between race, disability, and the school to prison pipeline has been relatively unexplored. According to the Losen and Gillespie (2012), 25 percent of black students who were diagnosed with a disability were suspended from school in the 2009-2010 school year compared to 9 percent for white students diagnosed with a disability. Furthermore, data shows 70 percent of juvenile inmates were diagnosed with learning disabilities and 33 percent were reading below a 4th grade level. This presentation will explore the complex relationship between disability, race, and the school to prison pipeline to highlight how minority special needs students are placed on a trajectory towards settings of incarceration. BIOGRAPHY: Charles Bell is approaching the final year of his PhD in Sociology at Wayne State University. He holds a B.A in psychology from Wayne State University and a M.A. in school psychology from Michigan State University. He is deeply interested in urban social issues such as zero tolerance policies, the school to prison pipeline, mental health, and community reform initiatives. Currently, Charles is working on his dissertation and teaching undergraduate courses in race and criminal justice at Eastern Michigan University. He is also running for State Representative in Michigan’s 4th House District. ABSTRACT: Dissident speech and radical social movements in the U.S. have consistently been met with state repression, ranging from deportations and malicious prosecution of activists to infiltration, surveillance, and violence against organizers. This history demonstrates that repression is a constant and continuing reaction to these movements – not merely an aberration or isolated incidents. Repression is the means the state uses to protect itself and its authority from political challenges; it can be a response to crisis or method of preserving normalcy, but always serves to limit political action and discourse. While the methods and degree of repression change based on the context of the particular movement, some level of repression is always present. The effectiveness of a movement depends not on its ability to avoid repression (a virtual impossibility) but rather on how well it anticipates, responds to, and counteracts the state’s repression. Examining the history and current trends in state repression, as well as movement responses, provides invaluable lessons for movement strategy, building effective solidarity, and organizing for liberation. BIOGRAPHY: James Clark is a lawyer and activist currently living in western Colorado. He has spent over seven years doing legal support and anti-repression organizing with radical communities in Colorado, Philadelphia, Houston, and Austin, and has been a member of Up Against the Law legal collective, Austin People’s Legal Collective, and Austin Informant Working Group.